Archaeologists with the Army Corps of Engineers are searching for what may be the sole photograph of Civil War-era ironclad CSS Georgia as they salvage its remains from the Savannah River. So far, the only person able to verify details about the photo is the man who found it at a yard sale in Georgia in the 1980s – John Potter. Potter said he was looking through a collection of antiques at a home in Waycross when he stumbled upon a picture frame that caught his eye. In the frame was a photograph with a silhouetted individual in a coat and hat positioned in the foreground of the hulking frame of a boxy object. 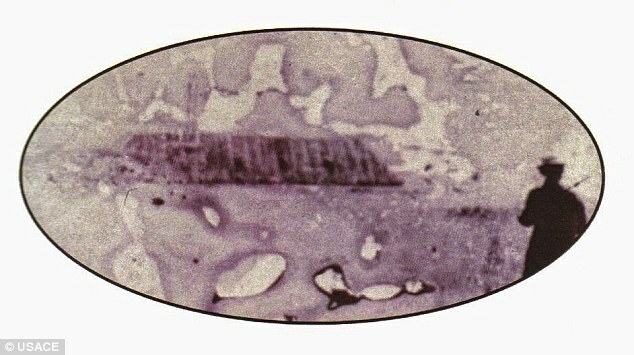 Potter described the photo itself as blurred and stained by damage from water or chemicals, but said an inscription on the back of the frame that read ‘CSS Georgia’ may accurately identify its subject. Potter did not have the $175 that the seller wanted for the photo, though he snapped a picture of it, a copy of which was later sent to the Georgia Historical Society. ‘The photo is just as much a mystery as the CSS Georgia, because nobody has seen it in years,’ said archaeologist Julie Morgan of the Army Corps of Engineers. The Corps is currently working on a $14million project to recover the wreckage of the ironclad from the bottom of the Savannah River. Joke of the Day What’s Wrong with a Well Regulated Internet?